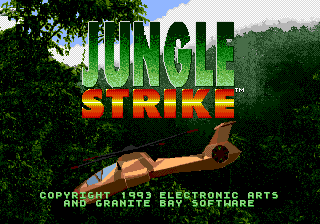 Jungle Strike: The Sequel to Desert Strike (Jungle Strike for short), called Jungle Strike: Uketsugareta Kyouki (ジャングルストライク 受け継がれた狂気) in Japan, is a 1993 shoot-'em-up developed by Electronic Arts and Granite Bay Software and published by Electronic Arts originally on the Sega Mega Drive before being ported to a variety of home consoles, including the Sega Game Gear. It is the sequel to Desert Strike: Return to the Gulf. A boat armed with nuclear weapons blows up a remote Pacific island. The explosion was to demonstrate the ability of a terrorist arms dealer, Ibn Kilbaba — the son of the now-deceased terrorist from Desert Strike — who has teamed up with the notorious drug dealing fugitive Carlos Ortega — whose capture cost many military lives — to take revenge on the US by blowing up Washington, DC. The original Special Forces helicopter team is now called to stop both men using the Super Comachine Attack Chopper. Gameplay is identical to the original Desert Strike: you move around the field using / to move forward and backward and / to rotate. shoots hellfires and jink, shoots hydra, shoots a regular helicopter gun, and opens up a map. The goal of each level is to complete some mission specified in a cutscene before each level. Main article: Jungle Strike/Magazine articles.